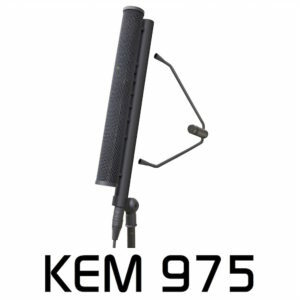 The KEM 975 is the successor of the famous KEM 970 line-array microphone and was, again, developed in collaboration with the Institute of Radio Technology in Munich. The system “Satellite” consists of the KEM 975 together with the optional delta capsule. The KEM 975, like its predecessor, works according to the line-array principle. The new features are the low-noise circuit design, the redesigned power supply and, especially, the optional attachable delta capsule. This capsule provides an increase in the directivity at low frequencies and thus an almost frequency independent polar-pattern. All signal processing is analogue, so annoying latency delays are avoided. The improved source separation at low frequencies offers great advantages especially in choral and orchestral recordings. For applications in videoconferences and on lecterns (which are predominantly speech orientated and do not have low frequency energy), the KEM 975 can be used without the delta-capsule to keep a clean profile. The revised design has advantages, especially during handling and installation – for example, the 5-pin XLR, that replaces the Tuchel on the original unit, reduces the overall length of the microphone. The stylish power supply can be run as a desktop unit or mounted in a 19″ rack (the power supply is half rack width and can also be mounted in a half width housing). Specifications such as intrinsic noise or maximum sound pressure level have been improved using a new circuit design. Click on THIS LINK to download a PowerPoint slide with embedded sound files so you can listen to recordings of the IRT test for effects of the delta capsule. The KEM 975 Cardioid Plane “Line-Array” Microphone consists of 8 critically spaced capsules, this microphone system achieves a vertical acceptance angle of just 30°, being significantly narrower than shotgun interference-tube technology, whilst avoiding the related phase problems. The additional optional “delta” capsule aids the directivity at low frequencies. The wide cardioid characteristic in the horizontal plane allows the KEM 975 to effectively cover a wide sound stage, e.g a choir, or drama production, whilst being able to record typically at distances up to 3 times that of an omni. The very narrow vertical acceptance angle allows the microphone to deal with ease with unwanted reflected sound from above or below. This new microphone has lower self-noise than the KEM 970 it replaces and is therefore more suited to recording (eg: opera, choirs, stage performances, etc.) than the earlier KEM 970. • Choir, or drama productions, where the microphone can overshoot an orchestra pit. Sub-mixes of choirs are reported to to exhibit much higher intelligibility due to lower intermodulation. • Speakers podia – motivated presenters can move freely from side-to-side without level change, while narrow vertical response deals effectively with unwanted reflections from the room – in special situations, the KEM 975 can be mounted horizintally which enables clear speech of the speaker sitting or standing and the speaker can speak an aside to someone on his left or right without being heard (the PEM 975 is specifically designed for this purpose).